No matter what level of experience you have in terms of your sailing ability, once you have decided that you’re going to live on a boat, you may wish to upgrade your existing skills or you may have people who are going to be living on board with you who have little or no boating skills or experience whatsoever and in whose interests it would be to gain some. It’s always a good idea to have some kind of formal training and certification. Even if you feel competent enough in handling your boat already and you think that you have all the necessary skills you’d ever need, you’d be surprised at the number and scope of the training courses which are available these days and, you never know, you might learn new skills which perhaps you’d overlooked which could come in extremely handy in the event of an emergency, for example. Sailing courses can be practical or theoretical in nature and sometimes a combination of the two. A good place to start investigating what courses are out there is to take a look at the Royal Yachting Association’s website. The RYA, as it’s more commonly referred to, is the most widely respected and recognised organisation in the UK in terms of its training courses and it has regional divisions based all over the UK and sailing clubs which are affiliated to it so you can often undertake certain courses close to where you live. 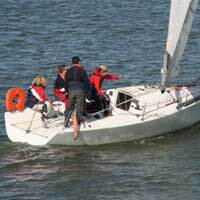 There are courses for those with little or no experience of sailing whatsoever. Some courses are day courses over a period of under a week whilst some are liveaboard based. On these courses, you’ll learn the basics of things like docking, anchoring, tacking, heaving to, reefing sails, crew overboard recovery, basic navigation and much more besides. These courses are for those who have undertaken a basic course and can be very useful for people who intend living on a boat too because as well as taking all the basic skills you’ve been taught on the earlier course and elaborating further upon those with more challenging exercises, you’ll also learn how to live afloat, how to plan journeys, understand and instigate emergency procedures, radio communications and more advanced navigational techniques and things like how to sail safely at night, for example. For those who might want to combine living on a boat with perhaps making some additional money by being employed as a skipper on another boat from time to time or even if you’re not planning on working on a boat or at all, a skippering or yachtmaster qualification will certainly be beneficial to even the more experienced sailor who has not undergone any formal training as such. These are just a few of the courses available and even if the RYA do not run a particular course you’re interested in, they’d be able to advise you on places and other organisations or companies where you’d be able to get the specific skills or knowledge you’re looking for. The truth is that the seas and the oceans can never be taken for granted. They can provide you with so many exhilarating and exciting adventures but equally they can be unpredictable and combined with harsh weather conditions, your pleasurable cruise could turn into your worst nightmare. This is one of the reasons why, apart from having respect towards the seas and oceans, you should never stop learning all you can about sailing upon them. Therefore, it’s well worth upgrading your skills and learning new ones from time to time as you’ll never know when they could come in handy and, in the event of an emergency, might even help to save your life.